Whilst this site is primarily focused on mountain bikes we do admire road riders, and none as much as we admire Tommy Godwin, holder of the one year time trial record. Thomas “Tommy” Edward Godwin was born in Fenton, Stoke-on-Trent on the 5th June 1912. His childhood was not a particularly easy one and he took a job at 12 years old to help support his family. This job was as a delivery boy for a general store/newsagents/butchers. To do his job Tommy was equipped with a heavy steel delivery bike. He enjoyed the cycling he did as part of his work and a lifelong interest in cycling began. At 14 Tommy saw an advert asking for participants in a 25 mile local time trial. Legend has it that Tommy removed the heavy basket from his bike, then borrowed wheels and shoes to complete the course in a winning time of one hour and five minutes. From these humble beginnings Tommy was soon riding for the Potteries Clarion Cycling Club before moving to Rickmansworth Cycling Club shortly after moving to London. During his amateur cycling career he won around 200 awards, many for 25 and 50 mile time trials. In 1933 Tommy finished a respectable 7th in the Best All Rounder Road Race Competition. This was based on time trials of 50 and 100 miles as well as a 12 hour endurance race. On the first day of the year 1939 he set off at 5am, with the intention of getting into the record books. His employer had agreed to sponsor him and Ley Cycles had provided him with a bike. The One Year Cycling Record was a completion started by Cycling Magazine in 1911 and had eight previous winners before Tommy started his challenge. He was aiming to beat the 1937 record held by Australian Ossie Nicholson who clocked up 62,657 miles or 100,837 km. To facilitate the record keeping Tommy’s bike was fitted with a sealed speedometer and he was observed by people from Cycling Magazine over parts of his year. Tommy’s strategy was a simple, if brutal one. He planned to Cycle 200 miles a day. Every day. For a year. He was going to break this down into four 50 mile sections, giving him time to rest and eat. Those first few months must have been incredibly difficult; he had to head to the West Country to find roads clear of Ice and snow. In the first two months alone he had two hospital visits, one minor accident with a car and several falls. Tommy did not have the benefits that we as modern riders take for granted. His heavy steel framed bike only had four gears, the clothing back then was not the breathable lightweight fabrics of today, he often cycled in heavy woollen clothing that would be soaking wet by the end of the day. By the end of March, with the worst of the winter weather behind him and the days getting longer Tommy had clocked over 15,000 miles. However his rival for the record, Bernard Bennett was catching up. He also needed a new sponsor as Ley Cycles could no longer continue. This is when the Raleigh Bicycle Company and Sturmey-Archer joined forces with Tommy to provide him with a new Record Ace bike and coach Charlie Davey. With the combination of the new bike, a coach, better weather and longer days Tommy was soon clocking up big miles and long days. On June 21st 1939, the summer solstice, he clocked up an incredible 361 miles in a single day. Whilst Tommy was cycling well external factors were about to play a part in his record challenge. On the 3rd of September 1939 World War 2 was declared. This lead to blackout restrictions at night and food rationing, both of which will have affected Tommy. He had to cycle in the dark, with a well shuttered light to allow him to see where he was going. On October the 26yh, 1939 Tommy rode in to Trafalgar Square, London to be greeted by crowds of supporters and onlookers. He had beaten Ossie Nicholson 1937 record by 66 days. But Tommy did not stop there, he carried on. He wanted to finish the year with a total that in his own words “could not easily be beaten”. By the end of the day on the 31st December 1939 Tommy had clocked up 75,065 miles or 120,805 kilometres, a record that still stands today. Tommy did not stop cycling after he completed the one year record, in fact he battled on through the winter of 1940. His aim was simple, to become the fastest person to reach 100,000 miles. This challenge was made even harder by the conditions, not only did he have winter roads to worry about, but also penalties for breaking blackout conditions and dwindling food, due to the strict rationing. On May 13th, 1940, Tommy rode into Paddington Recreation Ground Track to complete the 100,000 mile record, averaging 200 miles a day. Shortly after this Tommy was called up to the Air Force, he did not really get a chance to rest or bask in the publicity of his incredible feat. After the war Tommy wanted to return to cycling and cycle racing as an amateur, however as he had competed as a professional he was barred from doing so by the cycling governing bodies. This was a major disappointment for Tommy, but he never let this stop his love for cycling, he just channelled his energies into different pursuits. He became team trainer to the Stone Wheelers and was a huge supporter of the club throughout his life. In 1975, aged just 63, Tommy died whilst cycling home from Tutbury Castle with friends, he died doing something that he loved. In 2005 a plaque was unveiled at Fenton Manor Sports Centre in Stoke on Trent to pay tribute to Tommy. This plaque commemorates the outstanding achievement of Stoke-on-Trent cyclist Tommy Godwin. 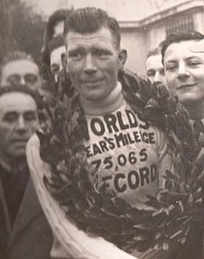 Holder of the world mileage endurance record over the twelve months of 1939 (75,065 miles) and then went on to cycle 100,000 miles in 500 days. Tommy Godwin – A true British hero. In 2015 Steve Abraham is trying to beat the record set by Tommy Godwin in 1939, we are hoping to have an interview with him soon.